After seven years of Palestine solidarity work in LGBTQ communities, Queers Against Israeli Apartheid will officially retire at the end of the month. 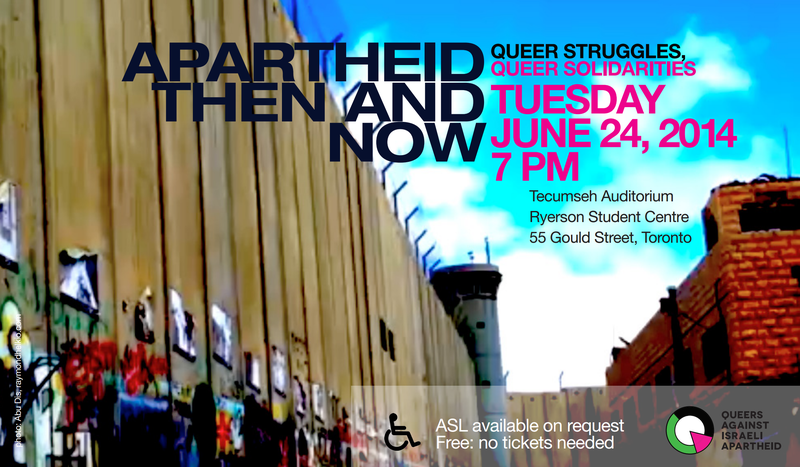 QuAIA was formed in 2008, after a public forum during Israeli Apartheid Week at the University of Toronto where concerns were raised about “pinkwashing”: Israel’s use of gay rights to divert international attention away from the state’s violation of Palestinian human rights. The small activist group was propelled into international celebrity after the pro-Israel lobby attempted to have Pride Toronto’s funding revoked in order to silence Palestine solidarity voices at the 2010 festival. *Educating Canadians about the conditions of occupation and apartheid policies in Israel and the occupied Palestinian territories. *Winning rulings under the City of Toronto’s Anti-discrimination Policy, Pride Toronto’s Dispute Resolution Process (under Ontario Arbitration Act), and at an Ontario Human Rights Tribunal, that the term Israeli apartheid is a legitimate form of political expression, despite aggressive attempts by the Israel lobby to brand criticism of Israeli government policy and actions as hate speech. *Making the terms “Israeli apartheid” and “pinkwashing” household words in queer communities in Toronto and around the globe. *Fighting attacks by several city politicians and lobbyists on Pride funding. *Sparking a community discussion about freedom of expression, censorship and politics at Pride, which led to a major rejuvenation of the festival and challenged the move to turn Pride into a corporate-driven spectacle geared to tourists. *Inspiring the formation of other QuAIA groups in queer communities around the world, and promoting dialogue and action on transnational queer politics. Over the past year, however, the deteriorating situation in the Middle East, Canada’s involvement in attempts to suppress the movement for Boycott, Divestment and Sanctions against Israel and other pressing issues have pulled activist energies in many directions. Most of the original members who came together during QuAIA’s formative years are now working within a variety of fields and organizations within Toronto and internationally, stretching the small group’s resources to continue in its current form. The QuAIA website will be archived and remain on line as a community resource. The Disappearing Map from Albino Squirrel Channel on Vimeo. 2014 World Pride Parade. Please join QuAIA as we put politics and Palestine front and centre!!! Please meet us at the Parkette at 77 Huntley (at Bloor) at 1:45pm. We will be assembling on Bloor St E. and Ted Rogers Way by 2:30pm at 19 K. Please look for our QuAIA Banners. Thanks!!! A panel discussion on the possibilities and challenges of queer solidarity. Accessibility: This event is held in a wheelchair accessible building and space. ASL is available upon request by emailing quaia.toronto@gmail.com by Friday 20 June. Please avoid using scented products and perfumes. Free Event: No tickets needed. Special Thanks to the Ryerson Student Union. Prabha Khosla is an urban planner who focuses on women’s rights. She was involved in southern Africa solidarity from 1976-1990. Solidarity work led her to South Africa, the Occupied Territories and the liberated areas of Eritrea, as well as to live and work in socialist Mozambique. She is currently writing a booklet on trade union support for LGBT rights. Sara Matthews is an Associate Professor in the Department of Global Studies at Wilfrid Laurier University. Her research and political work is interdisciplinary and considers the dynamics of violence, war and social reparation in the global context. She was involved with QuAIA from 2011 to 2013 and her teaching at WLU draws on cultures of global activism. Ghaida Moussa is a scholar, educator, and deejay. Completing a Ph.D. in Social and Political Thought at York University, Ghaida has also co-edited Min Fami: Arab Feminist Reflections on Identity, Space and Resistance. The Pride Toronto Dispute Resolution Panel has released reasons for decisions dismissing two additional complaints filed against QuAIA in 2012. The following deputations were delivered by members of QuAIA at the May 28 meeting of the Executive Committee of the City of Toronto on the subject of the new municipal Anti-Discrimination Policy. In the past year, pro-Israel groups such as B’nai Brith have continued their long-standing campaign to exclude QuAIA from the Pride Parade by demanding that the new policy explicitly proscribe any discussion of “Israeli apartheid.” The report on the policy handed to the Executive Committee on April 9, written by municipal staff and lawyers, made clear that such a provision would be inappropriate, but the Executive Committee, chaired by mayor Rob Ford, has refused to approve the policy, instead proposing a series of amendments that could be used to stifle criticism of Israel. City Council will vote on the issue at its upcoming meeting on June 11 and 12. I speak before you today as a member of the Toronto lesbian and gay community; as the former executive director of the lesbian and gay film festival; a former board member of Pride Toronto; as well as a member of the Jewish community. I am also a member of Queers Against Israeli Apartheid. I have fought for a good part of my life to obtain equal rights —those that allow me to speak before you as an equal citizen today. As a Jewish woman, I am all too aware of how fragile one’s equality is—and hence I do not only fight for my own rights but the rights of others as well. Many QuAIA members are Jewish with roots or implications in what takes place in Israel and Palestine. Other members are longtime human rights and social justice activists. On these bases—Pride has always been political and it is not for any one of you, not even councilor Pasternak, to decide which politics can or cannot be at Pride. My grandparents helped establish the State of Israel councilors. I grew up in Jerusalem. I am neither self-hating nor deluded. I have spent most of my adult life shadowed by and hence making films about the conflict in Israel and Palestine. Israel is a state like any other, with flaws, like many others. Israel is not a sacred cow and is not above critique. There is NOTHING inherently hurtful, hateful, anti- Semitic, or any other words that have been carelessly bandied about in the face of a critique of Israeli state policy. The words Israeli Apartheid are nothing more than a descriptor of systemic racist policies that one ruling ethnic group has imposed on another in the same land. I grew up in Israel, I think I have some authority and knowledge to tell you a little bit about what is happening there. It saddens me. This was my grandparent’s and parent’s dream, a land they help to build. But in that dream, others were dispossessed. And in that dispossession, much injustice has occurred. I am not afraid to say that, I am not afraid to admit when I and/or my people have erred. And Israel has indeed erred. In 2009, I lived in the West Bank for a year, yes, a nice Jewish lesbian living in Ramallah. My partner and I traveled every day for six months on a segregated road system; they are known as the apartheid roads because they are segregated by your ethnic identity. Roads for Jewish Israelis, roads for Palestinians. We made a film about these roads that screened at TIFF 2011. Yes, a film about the apartheid roads that thousands of people saw at TIFF. You cannot single out Pride, Councilor Pasternak. The Israel Supreme Court heard a case arguing that the road systems constituted a state of apartheid—The term is used in Israeli newspapers and by many Israeli politicians. Just in the last few months, countless articles appeared in the Israeli press citing Israeli Apartheid. Are they too creating “atmospheres of discrimination (or hurt)”? Are you suggesting that Toronto knows more about Israeli Apartheid than Israel? While there are voices from individuals in the Toronto Jewish community who may claim this hurtful, I too am the Toronto Jewish community. And I say otherwise. Enough is enough. Council’s cannot continue to single Pride out. This must end here and now. Your city staff has said so and Pride’s Dispute Resolution Committee has said so. Perhaps if councilor Pasternak and those who find the term Israeli Apartheid hurtful, could see the real effects of these insidious policies, perhaps just then, they would help us all move to peace, and not apartheid. What I’d like to talk about here is the politics of the closet versus the politics of pride, so I’ll begin by coming out of the closet to this committee in a couple of different ways. The first thing that I’d like to tell you about myself is that I was born in Toronto and raised largely within the queer community of this city. The second thing I’d like to disclose is that I have been in long-term relationships and casual sexual relationships with both men and women. For several years I was confused as to how to sexually identify, but I eventually came to identify as a queer myself. As an identity, queerness encompasses an expression of human solidarity, as well as a critique of heteronormativity, patriarchy, and other forms of oppression. Queerness is, in fact, the very ideology that has allowed me to feel comfortable exploring my sexual feelings toward other men. The third thing is that I am Jewish, and half-Israeli. Five years ago, I traveled to Israel and to the West Bank, where I lived for half a year. That experience significantly altered my perception of the Israeli-Palestinian conflict, as well as historical processes of colonialism more generally, and since then I have seldom revealed to an acquaintance that I am Jewish without also adding that I am an anti-Zionist. What I am saying here is that being a queer who is against Israeli apartheid is a fundamental part of who I am. It sounds incredibly naive to me when I hear anyone assert that Pride is not a political event, because my ability to express my identity as a queer is just as important to me as my ability to express my identity as a Jewish anti-Zionist. The rhetoric of groups such as B’nai Brith purports to encourage us to come out of the closet as non-heterosexuals, but simultaneously refuses to allow us to come out of the closet as members of the left. Those identities to me are inextricable. Pride became a major institution in Toronto amidst one of the largest health crises our city has ever faced. Between 1993 and 1998, over 7,300 Canadians died as a result of AIDS, and one quarter of those deaths took place here in Toronto. As this crisis hit, it soon became obvious that the culture of shame that dominated at the time was killing people; it was killing the queer community, it was killing our friends and members of our families. Multiple studies and historical assessments of the AIDS crisis have demonstrated that at an institutional level, homophobia exacerbated the AIDS crisis. The government and the medical establishment were slow to react, and carriers of the infection were stigmatized due to its association with the gay community. I see that as a relatively straightforward example of how the culture of the closet can kill people, and I’d like to propose to the committee that Pride is not simply about throwing a party in the street, or about bringing money into the city, or about getting wasted and getting laid. To some of us, Pride is also about saving lives. Since 2005, 3,400 Palestinians have been killed by Israel, while 125 Israelis have been killed by Palestinians. That means that in the past 8 years, over 96% of the deaths in the region have been Palestinian. I have never met a single soul who has visited West Bank cities like Nablus and Hebron and Jenin and still refuses to believe that Israel’s policies toward Palestinians are responsible for the ongoing death in that region. Indeed, as a result of those policies, Palestinians do not have a state, and they are therefore denied access to the rights of citizenship. During my time there, I met Palestinian children who have been permanently disabled and disfigured by Israeli bullets; I met multiple young men who had been imprisoned for years simply for demonstrating in the streets. It is well documented that throughout its history, Israel has detained hundreds of thousands of Palestinians without charge or fair trial, and that it continues to use torture systematically against these detainees, some of them as young as 12. Some Palestinians in Israeli prisons have in fact been tortured and beaten to death, and these deaths are ongoing. That Canada is complicit in these acts of violence is a source of shame and frustration for me, but I do have faith that if enough of us are fully allowed to express ourselves and have the patience to understand each other – if enough of us, in other words, are allowed to come entirely out of the closet – then we might be able to improve the situation there. We are simply demanding that we be allowed to talk freely about the issues that matter to us today, because they are a matter of life and death and because we remain hopeful that things will improve if we express enough understanding toward one another.